Yes, the wonderful garlic season is in full swing! You can use the leaves to make a tasty pesto or in place of spinach in curries and stir fry. The flowers are scrummy with a mild spring onion like flavour, delicious sprinkled over salads and other meals. They are very pretty too! 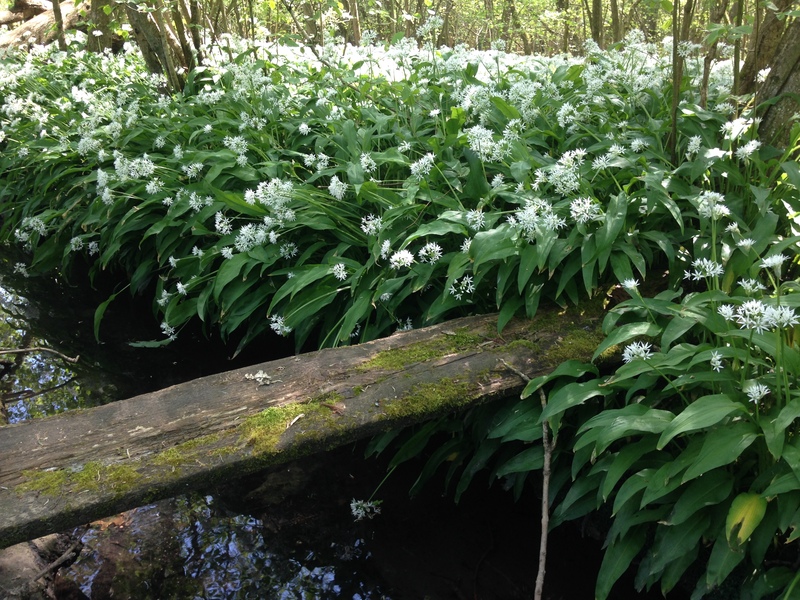 Basically if you have a stream or river running through woodland the likelihood is that wild garlic will not be far away – just follow your nose! Honour the foraging etiquette and only take what you will use personally. 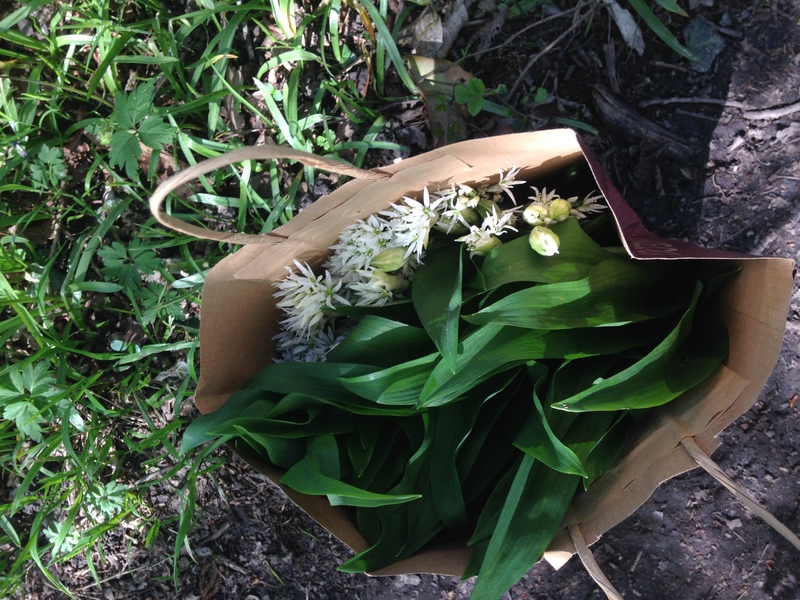 I tend to use a paper bag to carry my foraged yumminess home as it doesn’t sweat like it can in a plastic bag. The older, thicker, bigger leaves are less likely to wilt than the lovely fresh new ones, so I tend to forage these with the flowers. If there are flowers in buds I tend to choose them over open flowers. When I get home I pop the lot in a jar of water – to keep them fresh for use. This year I made a delicious wild garlic and basil pesto. It is amazing over a tomato salad accompanied with salt, pepper and a drizzle of tahini (if you can eat sesame seeds). Sprinkle some yummy wild garlic flowers over the top. Next time I make it I will remember to take a photo as yesterday I gobbled it all up without thinking, it was so delicious! Interestingly one of my neighbours is allergic to garlic and spring onions and other bulb vegetables, but she can tolerate the wild garlic leaves and flowers. So if you’re allergic to regular garlic you might like to CAUTIOUSLY experiment on yourself and see if wild garlic leaves and flowers are safe for you to eat too. This stunning bank holiday weekend try and get out for some fun family foraging and make some tasty savoury treats with your spoils. 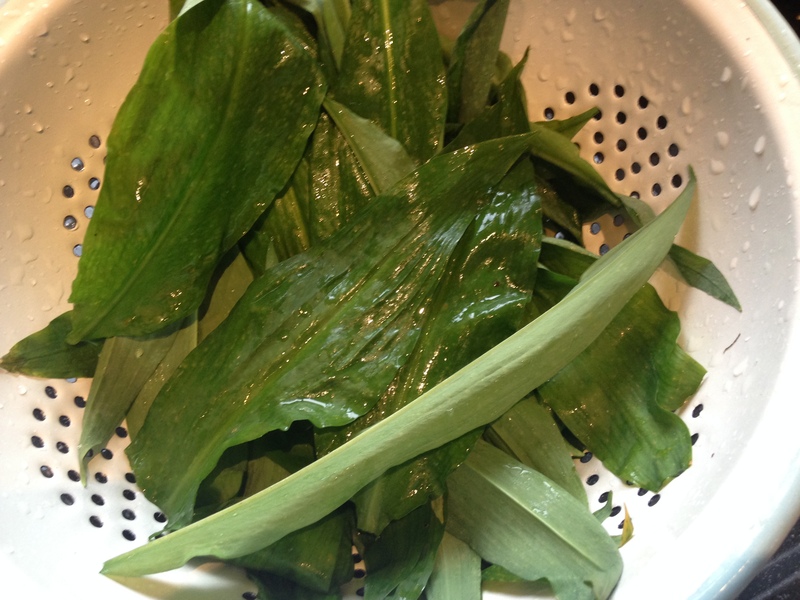 Here are some of our favourite free-from recipes with wild garlic. Nothing as scrummy as a simple fresh herb pesto. This basil and wild garlic pesto is just that. Bung the lot into the liquidiser. Pulse it to pull all the leaves down. I have to push the leaved down between pulses to try and help them reach the blades and get blitzed. (this is the slow part of the process - but only takes a few minutes) If your handfuls are bigger than mine - it's not an inexact measure and the leaves are not getting dragged down add a bit more olive oil. Once the leaves are all chopped add the salt and pepper and blitz to a lovely pesto consistency. Pop into an airtight jar and store in the fridge. Gnocchi are lovely comforting Italian creations, but I find the plain ones a bit bland so here are my lovely herby gnocchi with some scrummy wild garlic and other fresh ingredients. Really easy to make and even easier to eat. Mash in the oil, salt, pepper and herbs. Add the gnocchi to a pan of boiling water. Simmer for a few minutes until they start to float. Drain the gnocchi and leave them to steam dry for a couple of minutes (I pop them in my colander to steam dry so they don't stick to each other). Add some olive oil to a frying pan, heat up on a medium flame. Once the oil is hot add your freshly made gnocchi and chopped chillies and sauté for a few minutes until both sides of the gnocchi are nicely coloured. I sprinkle some ground cayenne pepper on the gnocchi before I turn it over. Once the gnocchi is nicely coloured on both sides bung in the tomatoes, wild garlic, herbs and flash fry. As soon as the tomatoes start to cook it's time to serve. I serve my gnocchi with fresh basil leaves and foraged wild garlic flowers sprinkled over the top. You can always drizzle a wild garlic pesto over the top too for an added hit of fresh yum. This is such a speedy, super tasty and healthy meal to make. Full of delicious, fresh ingredients, the tomatoes give it a lovely sweetness. I serve ours with a generous drizzle of my simple wild garlic pesto drizzled over the top. Really simple & really yummy. 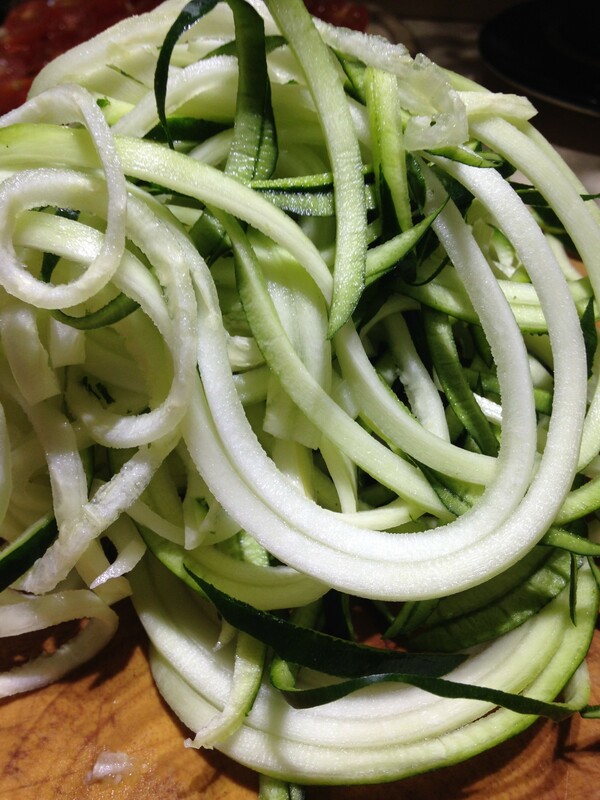 Make your courgettie spaghetti by using a spiraliser; chop all the tomatoes in half. I grind a load of pepper and himalayan salt on the tomatoes as soon as they are chopped up. It only takes a few minutes to cook so make sure you have done all your prep before you turn the heat on under the pan. Into a heavy based pan add 2 Tbs of olive oil. Put on a really low flame/heat and allow the oil to slowly heat up. Once it's warm add the courgettie spaghetti you have made. Stir it in so that all the courgettie spaghetti is coated, turn up the heat, dump all the tomatoes in with their salt and pepper. Cover with a lid and leave to cook on a high heat for about 3-4 minutes. Serve straight into the bowls, add the wild garlic pesto to the top of the servings. You can see from the photo I love to sprinkle some of the wild garlic flowers over the top - they are so pretty and give lovely little bursts of subtle wild garlic flavour. I make the wild garlic pesto before I start preparing the courgettie spaghetti. A few people have messaged me to ask how to spiralise - we use a simple hand-held spiraliser you can see it here. You cannot get more basic than this wild spinach pesto! When the wild spinach is in season there are fields of strong smelling white wild garlic flowers which line our local river - The Mole. We forage the leaves and flowers (off the beaten track). You need to use the leaves as soon as possible as they wilt rapidly, the smaller the leaves the faster they wilt, so gather the larger leaves for use. The flavour is mild in contrast to the scent. No worries about allergens with this recipe either, sometimes simplicity is the best way and I think that is definitely proved in this wild spinach pesto. Slice your wild garlic leaves into thin ribbons (I use a pair of scissors); then bung the lot into a liquidiser* and add the olive oil. Pulse them together a few times to ensure everything gets chopped down. I have to push the leaves back down between pulses (this is the time-consuming part of the process, but only takes about 4-5 minutes. Once everything is chopped down you can add the black pepper and blitz it all into a pesto. Pop into an air-tight jar and keep in the fridge, ready for use. *I use a liquidiser which attaches to my kenwood chef. Don't use a spice jar as it cooks the wild garlic making it go slimy & loose it's lovely mild flavour! A food processor will work if you don't have a liquidiser. When it's time to use your pesto pop it into the dish at the last minute. You don't want to heat it up or cook it as it will go into a slimy consistency and loose some it's delicious flavour and goodness. We love ours on courgette spaghetti, as a dressing over salad, and I love it drizzled over my homemade tomato soup. I love to add a sprinkling of the wild garlic flowers over the top of all of these dishes too - they give little bursts of fresh chive flavour to the meals. 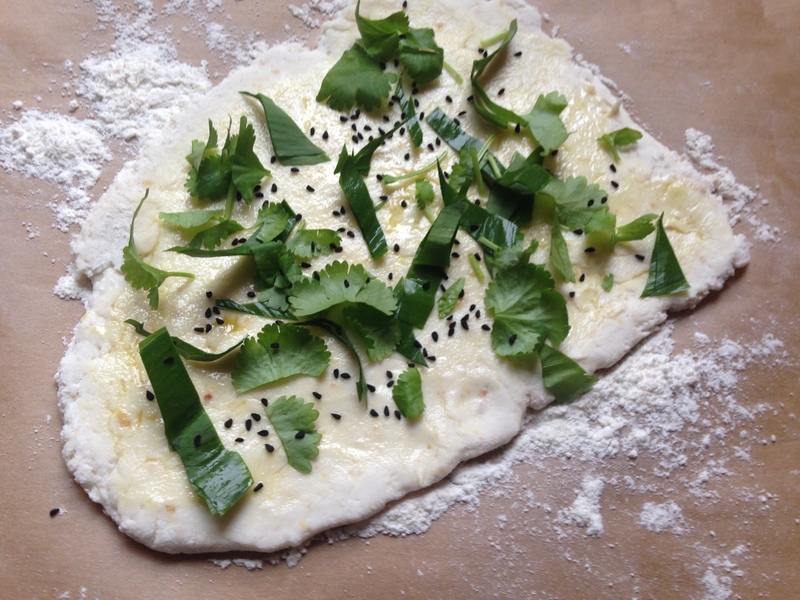 Lovely fresh naan bread - this one is especially special with foraged wild garlic leaves and flowers on it as well as coriander. Cover and leave to rise in a warm spot for a few hours. Preheat oven to 220°C (fan oven), with a baking tray in the oven to warm up with it. Knock back the dough on a floured surface and split into 5. 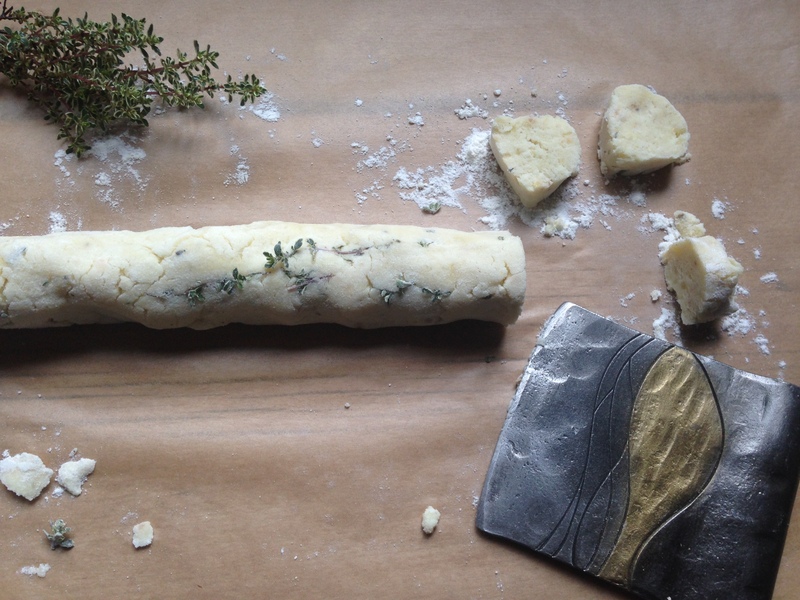 Roll the five bits of dough into balls and place all but one of them into oiled clingfilm. The fifth ball of dough roll out into a tear-drop shape until it's about 7mm thick. Cover with oiled clingfilm. Then one-by-one, repeat this process with the other balls of dough. Once the oven has reached 220°C take out a couple of your tear-drop naan and spread the oil around and then sprinkle as much wild garlic, fresh coriander and nigella seeds as you fancy on them. Take your baking tray out of the oven and put your naan bread on and pop them back into the oven ASAP! Cook for 7 minutes. While they bake prep the next two. Once they come out of the oven wrap in a clean tea-towel to keep warm and get the next two in. Once they are all baked dig in. These go beautifully with our sweet potato curry!